Tiburon is pleased to announce that the next Tiburon Research Call will be on The Future of Wealth Management. It will be held March 28, 2019 at 10:00am PT/1:00pm ET. If you are an employee at a Tiburon CEO Summit sponsor or Tiburon member and would like to listen to this call, please email Sarah Sage to RSVP. All employees from Tiburon CEO Summit sponsors and Tiburon members, as well as media representatives who cover Tiburon Research, are invited to join this call with Tiburon Managing Partner Chip Roame. This is one of 42 Tiburon Research Calls set for this year. To see the full Tiburon Research Calls calendar, please click here. If you are an employee at a firm that is not yet a Tiburon CEO Summit sponsor or Tiburon member and would like to become a Tiburon client to obtain access to Tiburon Research Calls, please email Sarah Sage. Tiburon is pleased to provide Tiburon CEO Summit sponsor and Tiburon member employees that missed the previous Tiburon Research Call on The Future of the Advisory Business. with access to the recording on the Tiburon web site by clicking the link below and logging in with one's username and password. If you are an employee at a Tiburon CEO Summit sponsor or Tiburon member and need your username & password to access this Tiburon Research Call, please email Sarah Sage. If you are an employee at a firm that is not yet a Tiburon CEO Summit sponsor or Tiburon member and would like to become a Tiburon client to obtain access to Tiburon Research Calls, please email Sarah Sage. Tiburon CEO Summit XXXVI will feature a Fireside Chat with Walt Bettinger (CEO, The Charles Schwab Corporation), and a public CEO panel featuring Tim Hockey (CEO, TD Ameritrade) & Karl Roessner (CEO, E*Trade Financial Corporation) as well as over 40 additional executive speakers from leading organizations discussing the financial services industry's most important strategic issues. Tiburon CEO Summit XXXVI will be held on April 1-3, 2019 at The Wagner at the Battery Hotel (FKA The Ritz Carlton Hotel) in New York, NY. 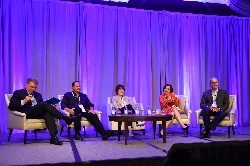 Over 250 industry executives have so far confirmed their attendance at this unique opportunity for leaders from throughout the financial services industry to gather to collaborate & candidly discuss the future of the industry. To find out how you can join them please see the Tiburon CEO Summit website or register via the link below. 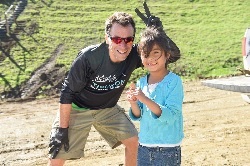 Tiburon Managing Partner Chip Roame and Tiburon clients Scott Hanson (Co-CEO, Hanson McClain) & Craig Wietz (President, First Rate) will co-lead Tiburon Impact Adventure 4.0 to build a home for a family in need in San Antonio Del Mar, Mexico on January 27-28, 2020. For more information, please email Craig Wietz (President, First Rate). Tiburon Impact Adventure 4.0 will be the fourth in a series Tiburon Impact Adventures which are intended to connect first world finance with developing world needs. Tiburon Impact Adventures 2.0 and 3.0 were co-led by Tiburon Managing Partner Chip Roame and Tiburon clients Scott Hanson (Co-CEO, Hanson McClain) & Craig Wietz (President, First Rate). On each occasion, twenty or so group members built and fully furnished a home for a family in need in San Antonio Del Mar, Mexico. Tiburon Impact Adventure 2.0 took place on January 27-28, 2018, Tiburon Impact Adventure 3.0 took place on January 15-16, 2019. Tiburon Impact Adventure 1.0 had been led by Tiburon Managing Partner Chip Roame and Tiburon clients Ben Cukier (Managing Partner, Centana Growth Partners), Scott Hanson (Co-CEO, Hanson McClain), & Aaron Klein (CEO, Riskalyze) in Ethiopia on January 15-18, 2017. That group raised over $100,000 for the construction of a fifth through eighth grade classroom building in the village of Adami Tulu. If you are interested in the Tiburon Impact Adventures generally, would like to propose a future Tiburon Impact Adventure, and/or wish to inquire about taking part in future Tiburon Impact Adventures, please email Scott Hanson (Co-CEO, Hanson McClain). Skip & Chip's Excellent Adventure 8.0 will take place July 13-15, 2019 in New Hampshire’s Presidential Range and be co-led by Tiburon Managing Partner Chip Roame and Tiburon client Skip Schweiss (President, TD Ameritrade Trust Company). For more information, please email Skip Schweiss (President, TD Ameritrade Trust Company). 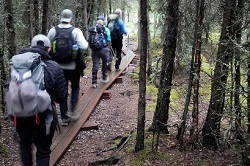 Skip & Chip's Excellent Adventure 7.0 took place recently on August 5-9, 2018 in South Central Alaska. The group, co-led by Skip & Chip, hiked the Crow Pass Trail, mountain biked in Alyeska, and kayaked in Seward, Alaska. More pictures coming soon! Skip & Chip's Excellent Adventure 8.0 will be the eighth in the series of adventures, in which participants have reached the tops of Mount Whitney & Mount Shasta, traversed the Grand Canyon, summited Half Dome in Yosemite, and completed the Kalalau Trail in Kauai, the Crow Pass Trail in Alaska, and the Four Pass Loop outside of Aspen, CO. The annual outing combines a challenging outdoor adventure with a fun weekend together. If you are interested in the Skip & Chip's Excellent Adventures generally, would like to propose a future Excellent Adventure, and/or would like to inquire about taking part in a future Excellent Adventure, please email Skip Schweiss (President, TD Ameritrade Trust Company). Tiburon is pleased to highlight its research on The Future of the Advisory Business. The purpose of this research is to provide readers with a comprehensive understanding of financial advisor winning tactics & strategies. This research serves to summarize the findings of these two underlying Tiburon research topics. A parallel Tiburon research topic, called the Future of Wealth Managnement addresses the industry from a corporate perspective. If you are an employee at a Tiburon CEO Summit sponsor or Tiburon member and need your username and password to access Tiburon Written Research, please email Sarah Sage. If you are an employee at a firm that is not yet a Tiburon CEO Summit sponsor or Tiburon member and would like to become a Tiburon client to obtain access to Tiburon Written Research, please email Sarah Sage. Tiburon is pleased to highlight its research on Envestnet. Envestnet was founded by Jud Bergman, Jim Lumberg, & Brandon Thomas in 1999. The firm is based in Chicago, IL. Envestnet has fourteen offices, 2,665 employees, $578.2 million gross revenues, $579.4 million adjusted revenues, $99.4 million adjusted EBITDA, & $43.6 million adjusted net profits. The company is led by its CEO Jud Bergman, Vice Chairman Anil Arora, President Bill Crager, & Chief Operating Officer Josh Mayer. Envestnet is a public company trading on the New York Stock Exchange under the symbol ENV. Its web sites can be found at www.envestnet.com, www.investpmc.com, www.primacapital.com, www.tamaracinc.com, www.yodlee.com, & www.yodleemoneycenter.com. Its profile includes the key statistics of the firm, including its number of offices, employees, gross revenues, adjusted revenues, adjusted operating income margin, non-operating income, EBITDA, adjusted EBITDA, & adjusted net profit margin. If you are an employee at a Tiburon CEO Summit sponsor or Tiburon member and need your username and password to listen to recent Tiburon Research Calls, please email Sarah Sage. If you are an employee at a firm that is not yet a Tiburon CEO Summit sponsor or Tiburon member and would like to become a Tiburon client to obtain access to Tiburon Research Calls, please email Sarah Sage. If you are an employee at a Tiburon CEO Summit sponsor or Tiburon member and need your username & password to access Tiburon Written Research, please email Sarah Sage. If you are an employee at a firm that is not yet a Tiburon CEO Summit sponsor or Tiburon member and would like to become a Tiburon client to obtain access to Tiburon Written Research, please email Sarah Sage. Due to the incredible demand from a large number of its executive-level clients to attend the Tiburon CEO Summits, Tiburon now holds the Tiburon CEO Summits at The Wagner at the Battery Hotel in New York, NY and the Ritz Carlton Hotel in San Francisco, CA. Several long-time Tiburon clients have supported Tiburon in this move. Tiburon clients Tiburon clients Advisor Software, Allianz, Apex Clearing Corporation, Aquiline Holdings, AssetMark, Brinker Capital, CAIS, Centana Growth Partners, CFRA Research, Charles Schwab, Discovery Data, Docupace Technologies, Envestnet, E*Trade Advisor Services, Fidelity Investments, First Rate, Fiserv, Genstar Capital, HiddenLevers, InvestCloud, MyVest Corporation, Orion Advisor Services, RBC Correspondent Services, TA Associates, TD Ameritrade, Valmark Financial Group and Vestmark are providing support for Tiburon CEO Summit XXXVI. To become a Tiburon CEO Summit sponsor, please email Sarah Sage. Sarah or another Tiburon team member will be happy to explain the sponsor benefits package in more detail to any qualified attendee (e.g., C-level executives, executive vice presidents, partners, & a few other business heads). Tiburon is growing rapidly and actively recruiting. Please read the below firm description and specific job descriptions. Tiburon Strategic Advisors (“Tiburon”) was founded in 1998 by a McKinsey & Company alumnae. The firm historically functioned as a boutique strategic consulting firm serving the worldwide financial services and fintech industries. Based on its two decades of substantial success, widely published industry views, and very broad set of industry contacts, Tiburon has evolved into a multi-faceted business, with its core services including its Tiburon Membership and Tiburon CEO Summits Sponsorship (Tiburon Written Research, Tiburon Research Calls, Tiburon CEO Summits) programs, conference speeches and market seminars, due diligence, mergers and acquisitions, and other CEO-level advisory roles, and ongoing board roles. Tiburon also generates substantial revenues from its own proprietary investments in financial services and fintech firms. The firm has published 2,000+ Tiburon Written Research papers, hosts 42 weekly Tiburon Research Calls for its 100+ corporate clients, hosts semi-annual Tiburon CEO Summits in New York, NY and San Francisco, CA for 250+ of its CEO-level clients, and invests in (and serves on boards of) numerous leading financial services and fintech companies worldwide. Tiburon is also structured as a highly efficient lifestyle business, maintaining a highly professional culture serving primarily CEO-level clients, with very high service standards, a 100% expected client retention rate, and substantial sales and revenues goals, all balanced with a focus on work/life balance. The firm’s managing partner values and closely measures results, with key results measures including the firm's revenues and profits, and its numbers of clients, attendees, listeners, and readers. The most successful candidates will have experience in professional services firm environments (e.g., private equity firms, management consulting firms, etc. ), experience working with CEO-level clients and fixed deadlines, and a clear revenue-orientation. At the same time, the firm has recently invested substantially to refurbish its physical office environment at Point Tiburon Plaza near the ferry dock aand water fountain in downtown Tiburon. And the firm is willing to consider unusual (albeit permanent) working models for parents with school age kids and other similar situations including part-time roles, job sharing, etc. Tiburon presents a unique career opportunity for highly-motivated, mature, and talented professionals in the Tiburon, CA area. Tiburon prefers to hire locally when possible. Tiburon has immediate needs for one or two publishing assistants, one or two marketing assistants, and one administration assistant, and is also adding more part-time student assistants. Tiburon Strategic Advisors is currently seeking one or two entry-level Publishing Assistants. Core responsibilities are to deliver three PowerPoint assignments per day. PowerPoint completion includes making noted edits to PowerPoint documents, revising parts in Microsoft Word and Excel, completing research and printing assignments, recording podcasts, and publishing all document parts to the Tiburon web site. More experienced members of the team should be able to complete three or more PowerPoint assignments per day and also add more value in research. The ideal candidate(s) will be dedicated and responsive team players who can support current publishing needs. This role can be part- or full-time, with morning hours being most important. A job share could also possibly work. Office is located in downtown Tiburon, CA. Please email cover letter and resume to Sarah Sage at SSage@TiburonAdvisors.Com. Tiburon Strategic Advisors is seeking one or two entry-level Marketing Assistants. The ideal candidate(s) will be dedicated and responsive team players who can support current marketing activities. This role can be part- or full-time. A job share could also possibly work. Office is located in downtown Tiburon, CA. Tiburon Strategic Advisors is seeking one entry-level Administration Assistants. The ideal candidate will be a dedicated and responsive team player who can support current administrative needs. This role can be part- or full-time, with morning hours being most important. A job share could also possibly work. Office is located in downtown Tiburon, CA. Tiburon is also continuing to seek to add entry-level part-time student assistants for administrative work (e.g., filing, data entry, data analysis, calling, and publishing (PowerPoint)). College and high school students are welcome to apply. Energy, attention to detail, and yet reasonable expectations will be keys to success. Some previous professional services firm office experience would be helpful. Starting pay is $14 per hour and potentially up to $18 per hour for those who advance to more important tasks and who are most productive. Please email cover letter and resume to Sarah Sage at SSage@TiburonAdvisors.Com. Tiburon was featured recently in Financial Advisor magazine in an article titled Economy Keeps Growing, But Unequally, Tiburon Says. Financial advisors are competing for an economic pie that has grown dramatically since the 2008-2009 financial crisis - albeit unequally. 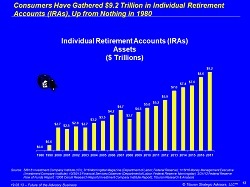 Article summarizes recent Tiburon Research Call on consumer wealth. Tiburon executives have been quoted quite extensively throughout the industry and general media. A list and brief synopsis of those articles that the Tiburon staff has been able to locate (Tiburon accepts that there are probably hundreds of other quotes circulating) can be found at the link below. These short summaries are intended to help prospective Tiburon clients, conference planners, and media representatives understand Tiburon's views on a wide variety of issues throughout the financial services industry. If you are a media representative interested in covering Tiburon, please email Sarah Sage.